VietNamNet Bridge - Two of Vietnam’s universities were listed among top 1,000 best universities in the world, marking a milestone in Vietnam’s tertiary education. Vietnam also won high prizes at international competitions for general school students. 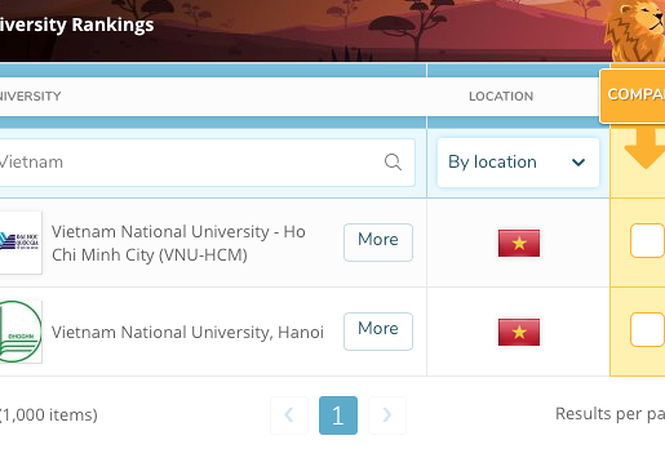 1/ Two Vietnamese universities were in the 2019 QS World University Rankings. Hanoi National University ranks among universities in the positions from 801st to 1,000, while the HCMC National University in the 701st to 750th. This is the first time Vietnam has had any of its universities listed among the world’s best universities. Prior to that, it had six universities listed among the top Asian universities in 2018. The schools included Hanoi National University (139th), HCMC National University (142nd), the Hanoi University of Science & Technology (291st-300th), Can Tho University (301st-350th), Hue University (351st-400th) and Da Nang University (417th). Vietnam was not listed in last year’s THE’s ranking. 2/ 2018 was a significant year for the national educational system as important adjustments were made to improve the quality of the national high school finals, commencing in 2019. Local universities and junior colleges will not get involved in the organization of exams in their localities. The other adjustments are related to how exam papers are made, the use of high technologies to prevent exam cheating, and supervision by watchdog agencies. Two of Vietnam’s universities were listed among top 1,000 best universities in the world, marking a milestone in Vietnam’s tertiary education. Vietnam also won high prizes at international competitions for general school students. 3/ On November 19, the National Assembly ratified the law on amending several articles of the University Education Law with 408, or 84.1 percent, votes. The new law will take effect on July 1, 2019. The higher autonomy given to universities is now applied on a trial basis to five schools and will be extended in the future to all training establishments. 4/Vietnamese students, once again in 2018, won high prizes at international competitions. Nguyen Phuong Thao, a biology major at the High School for the Gifted in Natural Sciences, came first in the International Biology Olympiad (IBO) which gathered 261 contestants and she was gloried as The First Winner. All the 38 students representing Vietnamese national teams of competitors attending international Olympiads won medals in 2018, including 13 gold, 14 silver and 11 bronze medals. The total number of medals won in 2018 was the highest in the last 10 years, though the number of gold medals was lower than 2017. 5/ HCMC authorities decided to reduce tuition for secondary education, commencing from 2019. Students in 19 districts of HCMC will have to pay VND60,000 instead of VND100,000, while students in the five suburban districts of Binh Chanh, Hoc Mon, Cu Chi, Can Gio and Nha Be will pay VND30,000 instead of VND85,000. National high-school finals too costly: are they necessary?